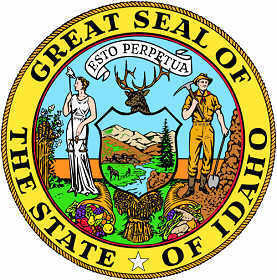 The Idaho state seal identifies government buildings and officials and is a centerpiece for the Idaho state flag. The symbolism, history and emblems of the Idaho seal are described in this article with fast facts and information. The figure of the woman represents Themis the ancient Greek goddess of justice and she holds the scales of justice. In her other hand she holds a spear covered by a liberty cap. The pileus, or Phrygian cap was said to be worn in ancient Rome by slaves who had won their freedom. The figure of the man represents a miner who holds a pick and shovel. 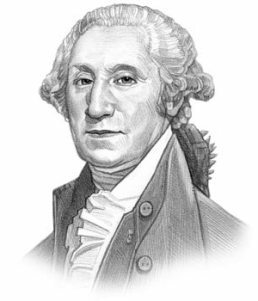 The Idaho seal is kept and used as required by the Constitution and laws of the state. 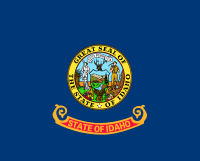 This is the 1904 banner of the state showing the design of the Idaho seal at this time. The banner illustrates the main industries of the state. A farmer is holding a scythe next to his crops of wheat and corn. A miner is depicted on the other side with a train and a smelter, a factory with a smoking chimney that depicts smelting metal from its ore.